Anyone or entity may nominate a company in Florida for these awards AND companies may self nominate. See our prior award winners and learn more about the steps they are taking to lead the industry! Any Florida manufacturing or distribution company which is a member by July 1, 2018, of the Manufacturers Association of Florida (MAF) or of any MAF affiliated regional manufacturers association is eligible for competition. Nominating organizations can include an industry group, supplier, customer, economic development organization, government organization, or individuals. Self-nominations are strongly encouraged. This designation will be granted to any MAF member company who goes through the Manufacturer & Distributor Company of the Year award process and becomes a finalist or winner. Once it has been conferred, the company may use it to promote their business as they see fit. 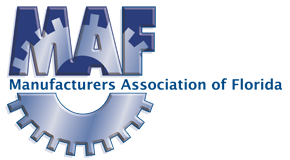 MAF members that receive this designation will have their names displayed as MAF Seal of Excellence companies on the MAF website. The Seal of Excellence shall only be awarded to MAF members reaching this level in the competition. Nominations and completed Organizational Questionnaires may be submitted electronically at www.MAFMFG.com or submitted as pdf via email to [email protected]. Questions may be directed to Lead Judge Mike Batts at [email protected] or 850-597-1227. Let’s nominate all those great companies in Florida who deserve recognition this year!